The very idea of recapping this event for you before I begin what I have to say is exhausting. I've decided instead to include some video footage of the event, as well as some links that describe what happened. 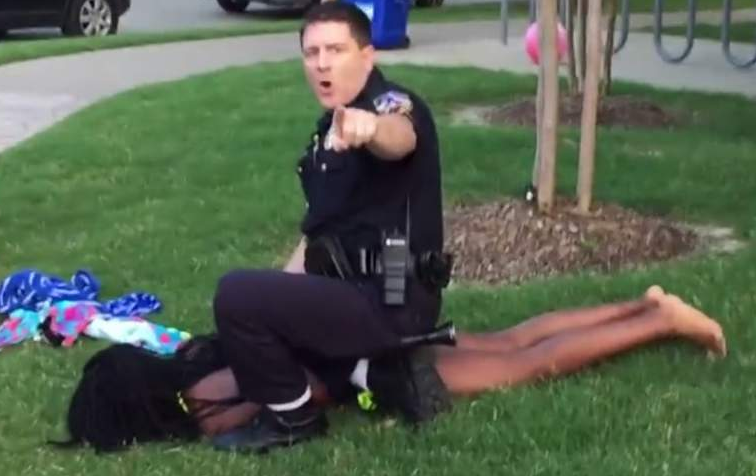 So if you don't know what #McKinney is all about, start here. Otherwise scroll down. I currently live in North Texas, about 45 minutes from McKinney, which does not bestow upon me magical unicorn authority to speak on the details of this particular event (a fact which, judging from social media, not everyone concurs on). However, it does cause everything to hit just a bit closer to home. A home which, incidentally, includes a beloved black son. So yes, I'm more emotionally invested in this case than the average white American. BUT I SHOULDN'T BE MORE TROUBLED BY IT. If I am a white American watching these videos and reading these accounts, and I am not deeply shaken and concerned for the state of my country, there is something very, very wrong. Let me ask you, white reader. When you were a teenager, were you ever once pinned to the ground on your swimsuit-clad stomach with an armed police officer's knee in your back while you ate grass and cried for your mama? No? Me neither. Because unless you'd posed a violent threat to another human being, this would be wildly inappropriate and unjust. AND IT IS. There were adult chaperones at this party. They were not sought out. Minors were. We thought we'd come so far. But we keep finding out it's been a lie, a mirage. Just under the surface, there is still a rumbling. We have work to do, my fellow Americans. And it doesn't start with a Facebook rant or this silly blog post. It starts with practicing the recognition of the God-given dignity in every human being in little ways, in little moments, throughout our day. This goes deeper than race, even. It sinks past that and goes into every single one of our prejudices, every single way that we see people for less than they are, every single time we let thoughts go through our minds without catching them and telling them to get the hell out. It's about the big fat bold faced lie that "you have to earn respect". No I don't. No you don't. No we don't. No they don't. Every single human being deserves to be treated with a base level of respect, even when circumstances are necessarily tough. Because each one of us has a piece of the Divine within us. And what's more, if you claim to be a Christian, to disrespect that is to disrespect the Incarnated Christ Himself. EDITED TO ADD: The backstory of what this police officer had endured earlier that day on duty is addressed here. We simply must change a policing system that dehumanizes cops.